BALTIMORE (JTA) – The pain of losing close relatives in the Holocaust is so acute that it has afflicted multiple generations of Audrey Greenberg’s clan. Greenberg, of Los Angeles, has a suitcase filled with photographs showing her late mother, Ruth, as a girl. The pictures also include other family members of Ruth’s parents, Yerachmiel and Sarah Leibenbaum. Starting in 1922, one or two at a time, five of Ruth’s sisters and their parents departed their ancestral home of Skidel, Poland, and settled in Chicago. Ruth, the youngest of nine — two brothers died in infancy — was the last to leave, in 1932 at age 15. In America, the parents changed the family’s surname to Bloom. One photograph in particular haunts Greenberg – the image of eight relatives left behind. 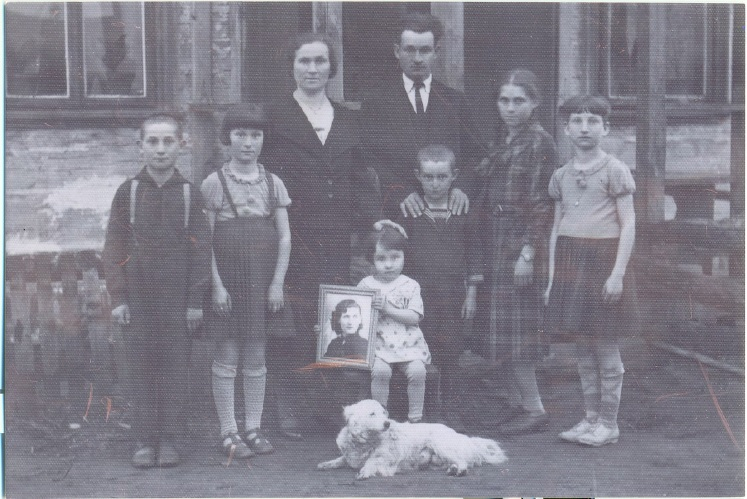 Her aunt Bluma Achun, Bluma’s husband, Yitzhak, and their six children are posing in front of their stone house in Skidel. The youngest child, a girl about 3, sits on a chair holding a framed portrait of Ruth, who had mailed the image after moving to Chicago. Everyone is dressed formally. A dog lounges in the foreground. It is a fine scene – and a heartbreaking one because they are all presumed killed in the Holocaust. Greenberg remembers Ruth receiving a letter from the American Red Cross stating that Yitzhak met his end in Auschwitz. Greenberg knows neither the others’ fate nor the children’s names. However, a Yad Vashem “page of testimony” that Ruth filled out reveals the children’s identities: Chana, 14; Libe-Rochel, 12; Elke, 10; Moshe, 8; Avromel, 6; and Yocheved, 4. Ruth completed the form on Oct. 27, 1974, at the Los Angeles office of the Council of Post-war Jewish Organizations, which presumably acted on Yad Vashem’s behalf. Ruth wrote that her relatives were killed in the Holocaust, but didn’t know where or when; it’s also unclear as of what date the children’s ages were calculated. Greenberg remembers Ruth telling her that the littlest girl had fled and was sheltered by a Christian family. Another time, Ruth related that the girl was thrown into the air by a Nazi soldier and shot in front of Yitzhak and Bluma. Why the clashing versions of Yocheved’s fate? Who provided the information? Greenberg has no idea. “My mother didn’t tuck me in bed with little fairy tales. She tucked me in with these stories,” said Greenberg, 69. Her mother also wouldn’t let her and her elder brother, Arnold, out of sight, Greenberg said. Greenberg internalized the message and would hide invitations she received to friends’ birthday parties. Yet when Ruth and her husband, Benjamin, were readying to go out one evening, and Greenberg begged them to stay, Ruth dramatically shed her coat and announced angrily that they would remain home. “I felt terrible, that I was to blame. I felt a lot of guilt,” Greenberg said. Many years ago, when a school administrator picked up on signs that Greenberg’s only child, Joshua, was exhibiting separation anxiety, Greenberg decided to confront the damage. She entered therapy and would attend four sessions weekly for many years. “He got healthier and I got healthier,” she said. The source of the anxiety, Greenberg figures, was her mother’s trauma. Greenberg recalls Ruth as a depressed, “very difficult woman,” but extends ample empathy, too. The roots of the tortured chain, she believes, went back even further to Ruth’s feeling abandoned as a 5-year-old, when Yerachmiel left for America, and by age 9, when Sarah and the sisters departed, too. Then came the Holocaust murders. “What happened to Bluma, and how my mother reacted and then me, and then my son had separation anxiety because of me,” she said. Myra Giberovitch, a Montreal-based expert on the trauma suffered by Holocaust survivors, figures that Ruth was struck by the pain of an “ambiguous loss” in which the circumstances of someone’s presumed death aren’t known. Zvi Bernhardt, the director of Yad Vashem’s reference and information department, told “Seeking Kin” that certain information is known definitively from records at the Israeli institution: Yitzhak was killed in Auschwitz on Jan. 1, 1943; he arrived there from the Skidel ghetto; he was born on July 15, 1893; and his father’s name was Mordechai. Bernhardt posited that the rest of the clan died in the ghetto or was killed upon reaching Auschwitz. In both scenarios, he said, the information almost certainly was not recorded. The notion that the Nazis recorded every death in concentration camps like Auschwitz, he said, is wrong; those killed in the hours after arrival went unnoted. Ruth appears to have approached the Hebrew Immigrant Aid Society to request information on her relatives in 1980 and in 1993, Bernhardt said. Why the Achuns remained behind in Poland when everyone else had departed, Greenberg doesn’t know. She remembers hearing that Yitzhak had shrugged off concerns about the dangers. Greenberg wants to determine what happened to her relatives. Maybe someone in the picture survived the Holocaust.